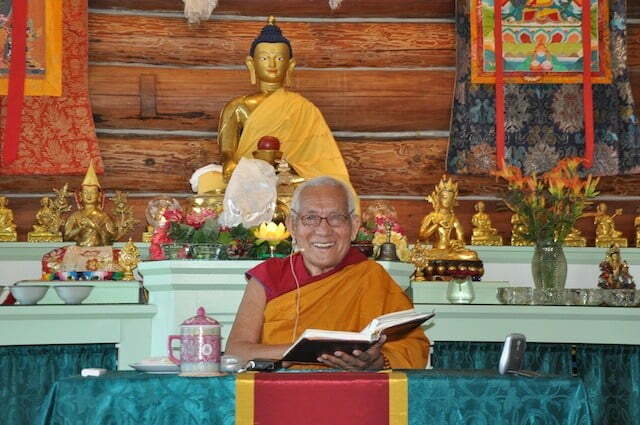 At the conclusion of his one-week course at the Abbey in July 2013, Geshe Thabkhe commented on the Abbey and gave parting advice so that both the monastics and lay followers of the Abbey can progress towards actualizing our aim of creating peace in a chaotic world. All four distortions* are suitable topics for meditation. All of you have listened well and have taken on the hardship of following the schedule and so forth. You have sat here and listened very attentively, so then I admire what you have done here. It’s very good. Also the abbess here is making great effort and all the other monastics working with her have been working very hard to build and improve this place. You are doing a wonderful job. I admire what you have done and what you are doing. Just to become a monastic in the present environment is very admirable. First of all, in this country where everyone is very busy and constantly distracted doing what they’re doing, you had the thought to step out of that life and pursue a virtuous path. The Buddha said that as times degenerate, for someone to do even a small virtue is a very effective virtue. In Tibet we had a lot of monastics. The reason to become a monastic is because the Buddha’s teachings are so vast and profound, you have to have a lifestyle that is conducive for spending time analyzing, investigating, and thinking about these teachings. It is very good that you have chosen this lifestyle, because without a monastic community spending time in this way—if there are only people spending a little time here and there studying the teachings—the Buddha’s precious teachings won’t survive in the world. To give up worldly life and to spend your time as a monastic is very admirable because it helps the Dharma—and the Dharma helps others. So what you are doing here at the Abbey is very admirable. It’s wonderful that not only have you taken precepts and work at being a renunciant, but you also teach others who are lay followers. That is excellent. In India Buddhism was easily wiped out during invasions in the 12th century, because everything was concentrated in the monasteries and the monastics hadn’t become involved in teaching the lay people. Due to the Dharma not being well established in the lay community, the teachings disappeared very quickly after the monasteries were destroyed. Thus the work you’re doing here to teach the lay community is very important and admirable. The Hindu community taught their lay community, so Hinduism survived the invasion, but the Buddhists were more concentrated in the great monasteries like Nalanda, so the Buddhist tradition disappeared from India. Thus the long term existence of the Dharma in a place has to do with the monastics teaching the lay community. We have collected a tremendous amount of very effective virtue in the last week. It is said that if you filled the universe with wonderful jewels and beautiful offerings to the Buddha it wouldn’t equal even a small portion of the virtue created by explaining, thinking about, and studying even one verse of the Buddha’s teachings. Beings that make offerings create causes that will result in having resources in their next life, but studying or teaching one verse of the Dharma will bring about liberation and omniscience in the future. So the merit from doing that is much greater. Please make strong prayers and dedications that the gurus of the tradition have long life and that the teachings remain in our world a long time. Also pray and dedicate that the virtuous activities of the Abbey increase and are successful for a long time in the future so that sentient beings may obtain full awakening. Learn more about Geshe Yeshe Thabkhe. *(1) Holding what is impermanent and transitory as permanent, static, and stable, (2) holding what is by nature unsatisfactory as capable of bringing us lasting pleasure and happiness, (3) holding what is unclean and impure as pure, and (4) holding what lacks a self as having one.